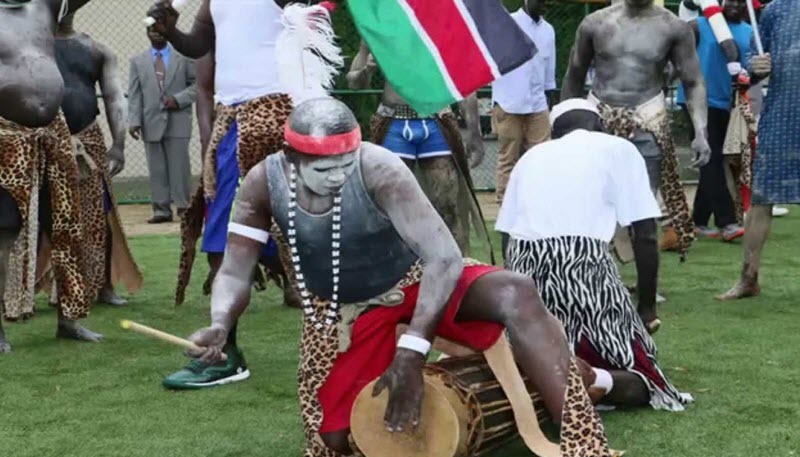 South Sudan is a country inhabited by many different ethnic groups, of which the most numerous one is the jieng (dinka). There are also many members of this people living in the Republic of Sudan. In the Nilotic languages, the dinkas refer to themselves as Muonyjang (singular) and Jieng (plural). In English, they are often called Dinka (singular) and Dinkas (plural). Several different Nilotic languages are spoken among the jieng, including Thuɔŋjäŋ, >Nuer and Luo. The Jieng have no centralised political authority for the group. Instead, they arrange themselves into numerous independent but interlinked clans. Some of these clans have traditionally provided ritual chiefs know as the beny bith (masters of the fishing spear). The Jieng community can be subdivided into several other ethnic groups, although exactly how to make these subdivisions is hotly contested. One of the largest of these subgroups is the Malual, comprised of approximately one million people. Since the arrival of Abrahamic religions, many jieng belive in one God (Nhaialic). God can speak to humans through spirits or by taking temporary possession of a human. A very important ritual is when the “master of the fishing spear” sacrifice an oxen. The traditional way of surviving for the jieng in South Sudan is agriculture and cattle raising, especially for milk production. When it comes to agriculture, today’s jieng tend to grow both food crops for their own subsistence and cash crops for trading. The major food crops are dura/sarghum and millet, while semsemi and groundnuts are common cash crops. Cattle and milk is very important for various rituals, including rituals pertaining to marriage. When jieng boys go through the initiation ordeal to enter adulthood, they acquire a second name derived from a cow-colour. Jieng cattle is often kept close to the river, and during the dry season they feed at the fringe of wetlands. When there is a risk for floods during the rainy season, the cattle is moved to higher elevations. Jieng will typically move to thatch housing well above the flood risk in May or June. This is where they plant their crops. The rainy season settlements tend to contain not just houses for humans to live in, but also luaks (cattle byres/barns) and granaries for storing crops. The harvest takes place in June and August, two very rainy months. In September, cattle is driven to the toic and allowed to graze on the remaining stalks for the crops. In December or January, most jiengs move to semi-permanent dwellings closer to the river, but family members who are ill, very old or have babies to nurse can remain in the permanent thatch housing. (Wal Kwai) The first person from the southern part of Sudan to become Vice President of Sudan. This happened in 1972. When South Sudan gained its independence, Mayardit became its first President. Francis Piol Bol Bok Born in 1979, he was captured by Arab slavers at the age of 7 and was a slave for ten years. Today, he is an abolitionist and author living in the USA.